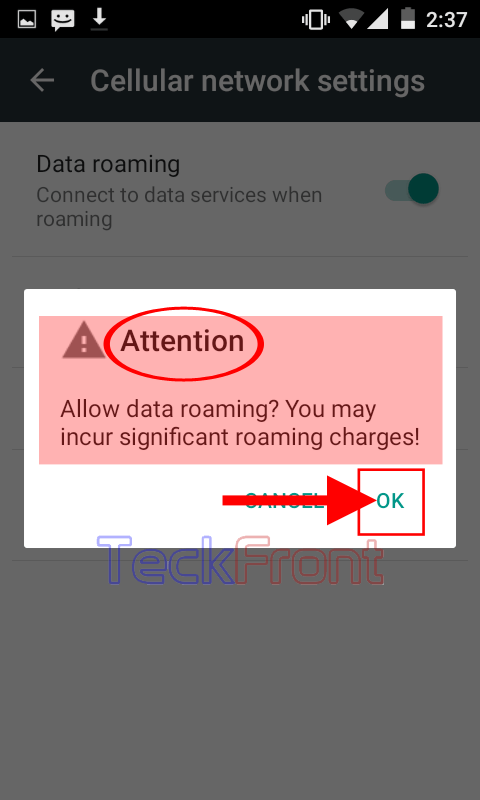 How to Enable Data Roaming While Roaming in Android 5.0.2 Lollipop? When you are visiting a place other than your permanent station of stay where you have secured a cellular connection for mobile device, the data roaming cost may be different, rather more than that for the home place. But, the change in the cost of data roaming service may depend upon the carrier of the cellular services. Anyhow, as a whole, most of the Internet carrier service providers cost more for the out station Internet service. But, if you are visiting abroad, the cost may be seriously higher than your home country. In the situation, it is advisable to avoid excessive data roaming to avoid excessive Internet usage charges. Android has a feature which, when activated, disables or enables the data roaming. It is easy to enable or disable data roaming, but if you are feeling any problem to do so, see the instructions. 1: Tap the icon of ‘Settings’ on the Home screen of your Android 5.0.2 Lollipop device to open up the ‘Settings’ screen. 2: At the ‘Settings’ screen, tap the ‘Data usage’ in the ‘Wireless & networks’ section. 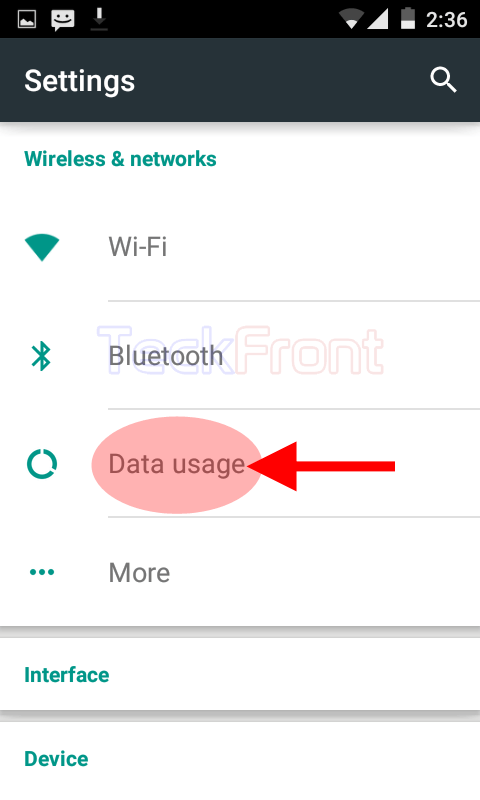 3: At the ‘Data usage’ screen, tap the settings button, placed at the top right corner of the screen, immediately below the status bar. It will open up a popup menu. 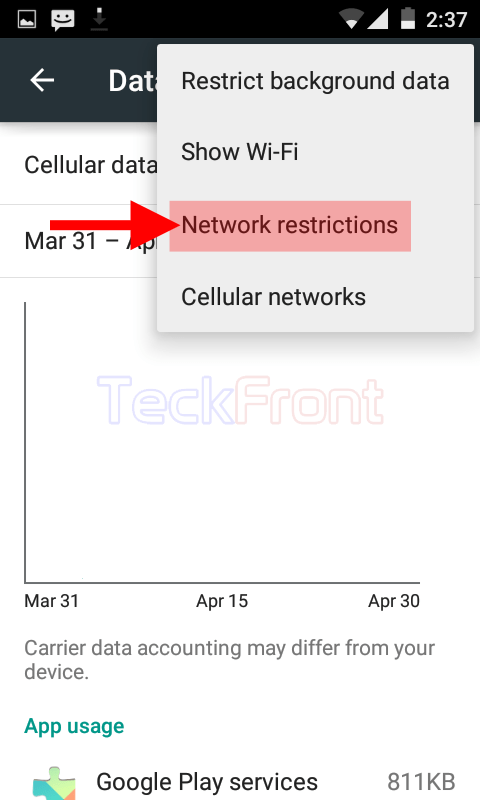 4: Tap the ‘Networks restrictions’ in the popup menu. 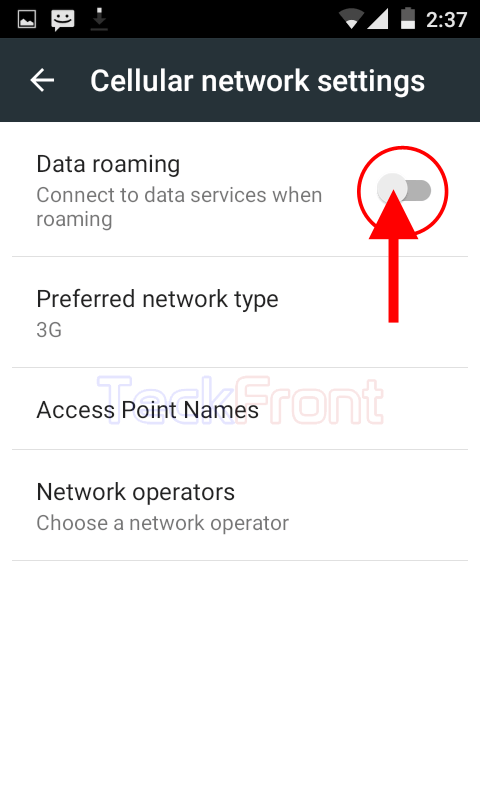 5: At the ‘Cellular network settings’ see the ‘Data roaming – Connect to data services when roaming – is switch off, indicated by the Grey color of the switch. Tap it and drag it to the right to turn on and a prompt will open up. 6: The prompt will inform you that if you allow your Android device to roam data, you may incur significant roaming charges. If you are still willing to allow data roaming, even after reading this warning, tap the ‘OK’ to go ahead. It will take you instantly back to the ‘Cellular network settings’ screen. 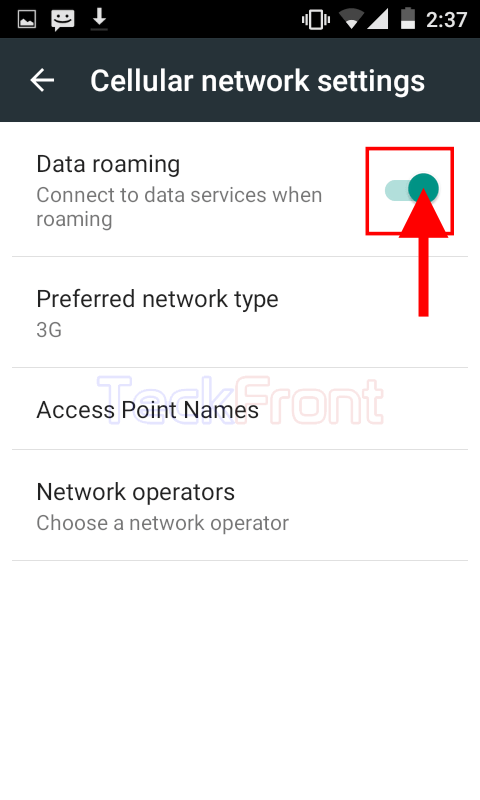 7: At the ‘Cellular network settings’ screen , see the color of the ‘Data roaming’ switch has been changed to Green, indicating that the data roaming is enabled. That’s all! 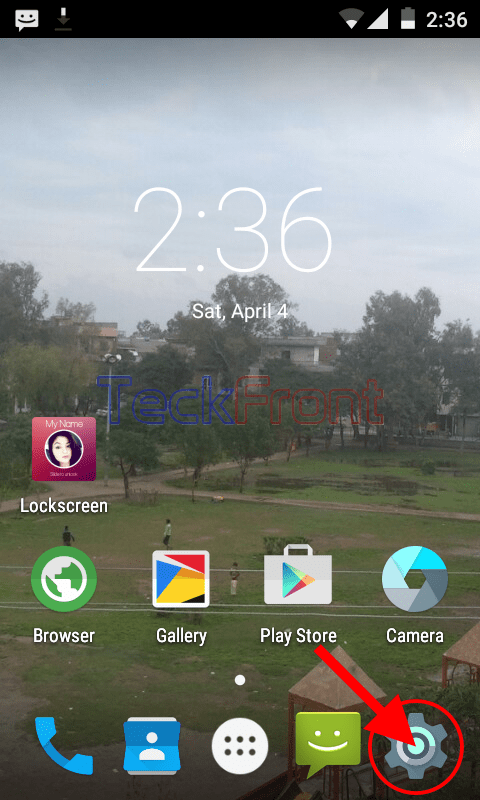 Newer How to Set Preferred Network Type in Android 5.0.2 Lollipop Devices? 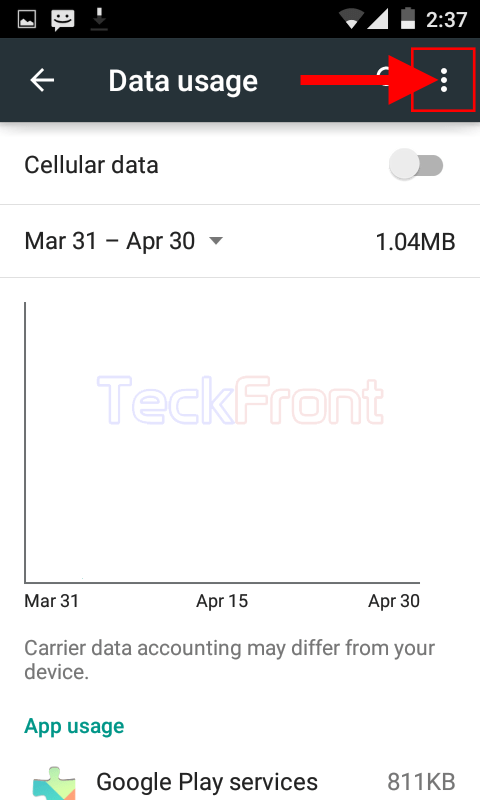 Older How to Restrict Background Data in Android 5.0.2 Lollipop Devices?